Animation controls are found on the left side of the Count Track. 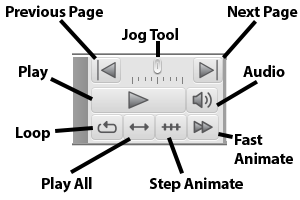 The Jog Tool is used to jog the animation forward and backward for a quick view. Releasing the jog returns the display to its previous condition. Previous Page will jump your anchors to the previous page’s transition. Next Page will jump your anchors to the next page’s transition. The Play button starts drill animation from the beginning of the drill or from the Yellow Anchor, depending on the setting of the All Counts switch found along the bottom of the animation controls. The Stop button stops the animation. The Loop option causes animation to loop continuously between the Yellow Anchor and the Red Anchor. The Play All option starts animation at the beginning of the drill file and continues to the end of the drill, regardless of the placement of both Red and Yellow Anchors. If All Counts is turned off, then the animation will start at the Yellow Anchor and end at the Red Anchor. 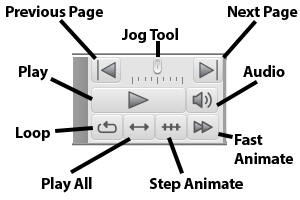 When the Step Animate option is selected, after clicking Play, animation will advance one count per [SPACEBAR] or [RIGHT ARROW] key press. the [LEFT ARROW] key press will reverse the drill one step. The Fast Animation option will play animation at a fast tempo for quicker review of transitions. Audio will enable synced music to play back with the animation. *A combination of both Loop and Fast Animation is a great way to preview the interaction of maneuvers of shapes to other shapes.